❤To explore the incredibly detailed views of the surface including craters, volcanoes, plateaus and more. ❤With this Sky Monocular Telescopes for Kids and Budding Astronomer, you'll have a blast. ❤ Featuring all coated glass optical components, the Travel Scope provides clean, crisp views. 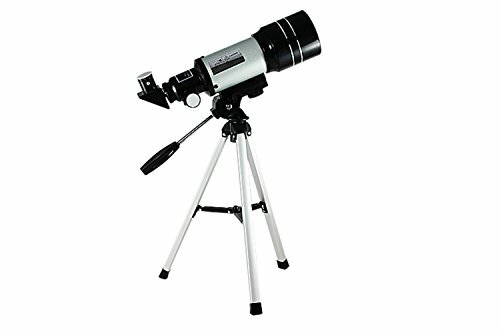 ❤Ideal for the astronomy beginner in your family,with a adjustable 38cm height tripod . ❤The telescope easily swivels up and down and side to side, providing a wide range of viewing angles. 【High Quality Optics】H20mm,H6mm 2 options eyepiece,3X barlow lens,1.5x erector and moon mirror,300mm focla length,70mm objective diameter,1.5X erector lens,coated lens. 【HD Views】View all the details of the craters on the moon with the H20mm eyepiece and moon mirror,use the H6mm eyepiece to viewing the terrestial objects on land. 【Easy to Setup and Use】Telescopes for astronomy beginners with tripod make the observation more steady,which provides a good environment to learning the nature and the universe. 【Perfect Science and Astronomic Gift for your Child】Powerful telescope for sky and land exploration,perfect gifts for your kids and astronomy beginners. 【Satisfaction Warranty】 Reliable and friendly customer service, Lifetime money back guarantee, Lifetime Warranty and Lifetime Support Guarantee. If you have any questions about this product by Moonee, contact us by completing and submitting the form below. If you are looking for a specif part number, please include it with your message.